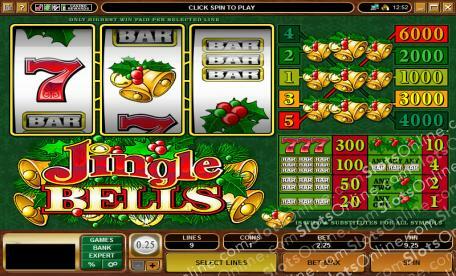 Christmas is always just around the corner in the Jingle Bell slots. Click here to play! With 5 different jackpots to be won, each unlocked as you bet more coins, you could find your Christmas shopping much easier this year if you win big on this festive slots game. Will you find lucky holly or BAR symbols? Will lucky 7s pave the way to a small fortune, or best of all, could you find three golden bells on the same active payline to take away one of the jackpot prizes? The only way to find out is to have a whirl on the Jingle Bell slots. See if your Christmas budget this year extends not only to presents for close family, but also to friends and your second cousins twice removed! Christmas is all about getting into the spirit of joy, and you're sure to be a lot more joyous if you hear the sound of hitting the big 6000 coin jackpot in the Jingle Bells slots. Who cares how many shopping days there are until Christmas? With the money from a Jingle Bells jackpot, you could get a personal shopper to do it all for you. The Golden Bells symbol is wild and can substitute for any other symbol.